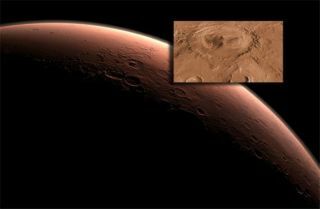 NASA's next Mars rover will land at the foot of a layered mountain inside the planet’s Gale Crater. Scientists who study the Red Planet say they whole-heartedly approve of the choice of Gale Crater as the landing site for NASA's next Mars rover. The space agency announced the decision to go with Gale today (July 22), after a five-year process that originally considered about 60 possible sites. NASA narrowed the list down to four choices in 2008, then revealed last month that it was deciding between two finalists: Gale and another crater called Eberswalde. Gale is 96 miles (154 kilometers) wide, and a 3-mile-high (5-km) mountain rises from its center. The crater also harbors clays and sulfate salts, signs that liquid water flowed in the area long ago. Maria Zuber (geophysicist at MIT in Cambridge, Mass. ): To be honest, I am thrilled with the decision to land in Gale Crater. Geologically, the site is complex. But given the mission objectives, that is a good thing, as it contains much of what one would like to observe and measure to assess habitability and biological potential, and how these may have changed over time. The Curiosity payload and the ruggedness of the rover are well suited to address the science objectives at this site. With such a singular mound of sedimentary rocks, the view will combine aspects of seeing Mt. Rainier and the Grand Canyon. Along the way, the rover will see clays from a wetter Mars and could drive to where those clays meet the sulfates deposited during the drying out of the area. As an atmospheric scientist, I am also looking forward to watching the seasons at the site. It was the site best positioned for seeing water-ice clouds that form every northern summer, when Mars is farthest from the sun. All of the finalist sites were good, but Gale seemed to be the one that had the biggest story about Mars' history to tell. Peter Smith (planetary scientist at the University of Arizona in Tucson): Gale Crater is an excellent site that allows exploration in the truest sense. The challenges and rewards of driving a nuclear-powered rover up a 5-km mountain over several years will test the abilities of both the science and engineering team. I am sure that they are up to the task and look forward to the results. Chris Carr (engineer and research scientist at MIT in Cambridge, Mass. ): Any of the final four options (Gale Crater, Eberswalde Crater, Holden Crater or Mawrth Vallis) originally considered by NASA would have been great (that is why those sites made it to the top four). One challenge for Gale Crater is the need to traverse a significant distance to reach the central mound of the crater, where the rover could study the stratigraphic layers of (presumed) clays and sulfates. These deposits are very interesting, because on Earth such deposits can preserve organic materials over geologic timescales. For example, some lipids can be preserved for up to billions of years. Chris McKay (astrobiologist at NASA's Ames Research Center in Moffett Field, Calif.): I am happy with the decision to go with Gale Crater. SPACE.com: What are the most exciting or interesting aspects of Gale? McKay: The prospects of investigating clays and sedimentary layers that span most of, if not all of, Mars history in the central mount in Gale Crater. The evidence for water ranges from the deposition of the mountain itself to the chemistry of the rocks to channels that cut the terrain, and argues for an extended and changing aqueous history. Smith: The wealth of water-related features and altered minerals opens a window onto the past history of Mars that has never before been explored. My hope is that there remains ample evidence showing that organic materials were common in ancient Mars. Slowly working our way up through the layered deposits is sedimentary geology done in a classical fashion. Can we find the transition from an early wet Mars to the modern dry state that we see today? The question then is what happened to the water — Gale Crater may hold the answer. Carr: The thick stratigraphic layers of the Gale Crater central mound. If Curiosity is able to traverse to and up through these layers, we will be taking a walk through time that covers a large swath of Martian history, a period when Mars may have been more habitable than it is today. SPACE.com: Do you have high hopes for Curiosity's mission? What do you think it will find? McKay: I do indeed have high hopes for Curiosity's mission. I think we will be able to detect organics on the surface of Mars. My optimism on this is the result of the combined Phoenix and Viking results. Taken together, they imply that there are organics in the soils of Mars (at the few ppm [parts per million] level) but that the presence of perchlorate prevented their detection by the Viking instruments. Zuber: Whenever we have looked in a new place at higher resolution or with new sensors, the discoveries have been remarkable, and I expect Curiosity to continue in the great tradition of Mars robotic explorers. As far as what the rover will find, I have a wish rather than a prediction. I am hoping that as Curiosity moves up the stratigraphic section in the central mound and maps the evolving chemistry, that the measurements will inform our understanding of the role of the atmosphere in the evolving surface environment. Lemmon: If the rover lands safely, the investigation of the clays and sulfates at the base of the mound will put MSL onto the list of missions that revolutionize what we know about Mars. Carr: I definitely have high hopes. This is an extremely capable rover with a tremendous set of instruments. In particular, I am personally excited about the role the ChemCam instrument will play in providing rapid context at a distance, the in-depth sample analysis capability of the SAM instrument and the radiation data that will be collected by DAN, with its implications for modern habitability of Mars, including for future human visitors. I make no predictions but hope we will find unambiguous evidence of organics among the layers in Gale Crater.